1998 to 2006 Td5. This obviously only works if your Land Rover is original, if you have one of those early pre production 1986 Td5 models or a rebuilt motor you will need to check your column! RDX have developed an affordable Slimline Boss. LAND ROVER FREELANDER MK1 2004 - 2006 manual. BLACK LEATHER WITH BLACK DOUBLE STITCHING. The plastic surrounds or the gear knob is not included. 100% REAL LEATHER BLACK. 100% GENUINE ITALIAN LEATHER. Easy to fit. It takes you about 50 mins. You need to put the cover on the steering wheel and sew it on. SELF ASSEMBLY BEIGE REAL LEATHER CAR STEERING WHEEL COVER FROM ONE PIECE OF LEATHER WITH BEIGE STITCHING. 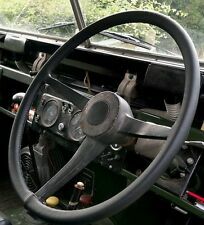 It has been drilled and tapped with the correct thread to fit Land Rover Defender main gearbox. Simply unscrew your existing ball and screw this one on. Much better than the cheapy universal push fit ones! FITS LANDROVER DISCOVERY 3 2004-2009. And what you will receive is only the leather part. Black leather. LAND ROVER DISCOVERY SERIES 1 1996 TO 1998 & LAND ROVER DISCOVERY SERIES 2 1999 TO 2004. And what you will receive is only the leather part. 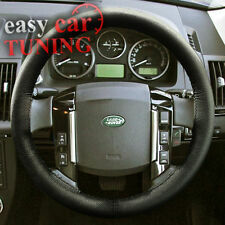 LAND ROVER FREELANDER 2003-2005 automatic. The plastic surrounds or the gear knob is not included. You can simply reuse an old one from your car. Purpose made for your car model - Not Universal. EASY TO FIT AND EFFECT IS AMAZING ! Gear leaver gaiter handbrake gaiter hi-low transfer leaver. gaiter made from 100% genuine Italian leather. LAND ROVER DISCOVERY SERIES 1 1996-1998 & SERIES 2 1999-2004. And what you will receive is only the leather part. LAND ROVER. THIS COVER WILL FIT LAND ROVER FREELANDER 2nd GENERATION (L359) FROM 2006 - 2014. LAND ROVER FREELANDER MK2 2006 - 2014. Sill Step Tread Plate Kit. How to fit sill step cover door tread plate kit to Range Rover Sport - YouTube. These plates have the word "SPORT" in a polished finish with an etched surround. These cover plates fit onto the painted part of the door entry step that often gets scratched and scuffed in use. LAND ROVER FREELANDER MK2 2006 manual. 100% GENUINE ITALIAN LEATHER. These are made from genuine Italian leather. 100% REAL LEATHER BLACK. The plastic surrounds or the gear knob is not included. 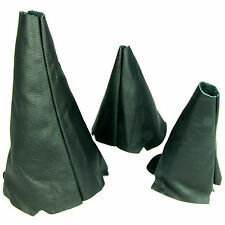 Top quality gear gaiter made from 100% genuine Italian leather. The plastic surrounds or the gear knob is not included. Make: CITROEN. Model: C4 PICASSO 2006 . Leather Colour: Black. Transmission: Manual. LAND ROVER DISCOVERY SERIES 1 1989 TO 1998 OR SERIES 2 1999 TO 2004. Black leather with stitching as titled. BLACK LEATHER GEAR GAITER SHIFT BOOT. This leather gaiter will improve the appearance making, your gear shift look like new again. 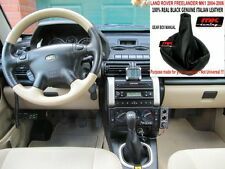 LAND ROVER FREELANDER 1996 - 2003 AUTOMATIC. LAND ROVER. RANGE ROVER. LAND ROVER SERIES IIA 1961-1971. VERY HIGH QUALITY CUSTOM MADE FITS PERFECT LIKE A GLOVE HANDCRAFTED WITH TOP GRAIN LEATHER. Motorcycle seat strap cover. FITS LAND ROVER DISCOVERY 1989-2004. Black Leather with stitching as titled. Gear leaver gaiter hi-low transfer lever gaiter. DISCOVERY SERIES MK1 1989 TO 1998 OR. SERIES MK2 1999 TO 2004 ONLY. HIGH QUALITY GEAR GAITER COLOR BLACK. The plastic surrounds or the gear knob is not included. Sill Step Tread Plate Kit. Land Rover Discovery 3 door step tread plates - YouTube. Land Rover Discovery 3 / 3 2005 onwards. This item will fit all Land Rover Discovery 3 and Discovery 4 models. Enhance your Discovery 3 or 4 by fitting these door step protector cover kits. And what you will receive is only the leather part. LAND ROVER DISCOVERY SERIES 1 1996 TO 1998 & LAND ROVER DISCOVERY SERIES 2 1999 TO 2004. THIS COVER WILL FIT LAND ROVER FREELANDER MK2 FROM 2006 - 2012. LAND ROVER FREELANDER MK2 2006 - 2012. LAND ROVER. RANGE ROVER. VERY HIGH QUALITY CUSTOM MADE FITS PERFECT LIKE A GLOVE HANDCRAFTED WITH TOP GRAIN LEATHER. These are the real deal ! Simply unscrew your existing gear knob and screw your shiny new pool ball on in it's place. Well I'm not going to. I've been drilling pool balls for ELEVEN years now. It's not rocket science. THIS COVER WILL FIT RANGE ROVER P38 FROM 1994 - 2002. RANGE ROVER P38 1994 - 2002. RANGE ROVER. LAND ROVER. Motorcycle seat strap cover. VERY HIGH QUALITY CUSTOM MADE FITS PERFECT LIKE A GLOVE HANDCRAFTED WITH TOP GRAIN LEATHER. As a land rover Fanatic! LAND ROVER. RANGE ROVER. THIS COVER WILL FIT LAND ROVER DISCOVERY FROM 1989 - 2010. LAND ROVER DISCOVERY 1989-2010. VERY HIGH QUALITY CUSTOM MADE FITS PERFECT LIKE A GLOVE HANDCRAFTED WITH TOP GRAIN LEATHER. Range rover P38 1995 to 2002. And what you will receive is only the leather part. Black leather with black stitching. LAND ROVER DEFENDER 90 100 1983-2006. Black leather with RED stitching. And what you will receive is only the leather part. LAND ROVER. RANGE ROVER. 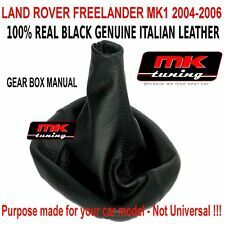 THIS COVER WILL FIT LAND ROVER FREELANDER MK1 FROM 1997 - 2006. LAND ROVER FREELANDER MK1 1997-2006. Motorcycle seat strap cover. VERY HIGH QUALITY CUSTOM MADE FITS PERFECT LIKE A GLOVE HANDCRAFTED WITH TOP GRAIN LEATHER. THIS COVER WILL FIT RANGE ROVER P38 FROM 1994 - 2002. RANGE ROVER P38 1994-2002. LAND ROVER. RANGE ROVER. HANDCRAFTED WITH TOP GRAIN LEATHER. Motorcycle seat strap cover. ITALIAN LEATHER STEERING WHEEL COVER. LAND ROVER DISCOVERY 200TDI 300TDI TD5 V8 SERIES 1 1989-1998 & SERIES 2 1999-2004. And what you will receive is only the leather part. gaiter made from 100% genuine Italian leather. Fascias x2. Epoxy To Prevent Scratch Marks And Sun Bleaching. Our Fascias. To Remove Any Panels As Our Fascias Fix Directly Onto Your. Existing Panels. Our Fascias Are fitted With The Latest 3M. You Will Receive The Fascias Shown In The Unfitted Photo Directly Below. Gear leaver gaiter handbrake gaiter hi-low transfer leaver gaiter. DISCOVERY SERIES MK1 1989 TO 1998 OR. SERIES MK2 1999 TO 2004 ONLY. LAND ROVER. The plastic surrounds or the gear knob is not included. Cheaper than buying the three knobs individually. This is not a duplicate item. 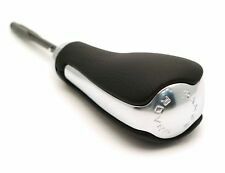 They can also be made suitable for series 2/2a (screw on main gear knob). Series 3 vehicle set. Rest of planet Go on, give your motor a bit more personality.